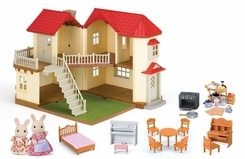 Calico Critters Cloverleaf Townhome Gift set includes more than 50 pieces of furniture and accessories. The Calico Critters Gift Set comes with everything you need to have the coolest house on the street. The fold-up dollhouse includes 2 adorable Calico Critters Rabbits and features four large rooms with a divider, allowing you to create a fifth room. It also comes with over 50 pieces of furniture, including a kitchen cart, hutch desk, grand piano with bench and more. The movable staircase attaches easily to the second story or the balcony, and an expandable floor offers extra room. When nighttime falls, simply flip on the two light fixtures for tons of after-dark fun! No matter what time of day, you're sure to have a ball playing house with the Calico Critters Gift Set. Welcome to the cute and cuddly world of Calico Critters of Cloverleaf Corners! These adorable miniature animals live in precious homes decorated with life-like furniture and accessories. Each Calico Critter family plays a different role in the community, and they all reside in Cloverleaf Corners - a happy and peaceful place, surrounded by beautiful nature. Calico Critters are wholesome and realistic. Built around the traditional values of family, friends and community, they encourage little girls to use imagination and share their own experiences as they play. Calico Critters are designed with remarkable attention to detail. Each Critter has soft textured flocked "fur" and beautiful hand-made clothing. The family Critters and triplets are poseable, with jointed arms and legs, and heads that turn. Twins have heads that turn. Parents are approximately 3" tall, brothers and sisters are 2.25" tall, triplets are 1.75" tall, and twins are 1.25" tall. Sets mix and match. Build a whole Calico Critters village. Collect them all! The Calico Critters Gift Set comes with everything you need to have the coolest house on the street! The fold-up dollhouse includes two Calico Critters rabbits and features four large rooms with a divider, allowing you to create a fifth room if needed. The house also comes with more than 50 pieces of furniture, including a kitchen cart, a hutch desk, a grand piano with a bench and more. The movable staircase attaches easily to the second story or the balcony, and an expandable floor offers extra room. When nighttime falls, simply flip on the two light fixtures for tons of after-dark fun! No matter what time of day, you'resure to have a ball playing house.